Summer is finally here! No more studying. No more homework. No more textbooks. Which means we have so much time to catch up on our to-be-read piles and reading lists. I don't know about you, but my reading list is always forever long and sometimes I need a little push to keep reading. This is where the TFI Summer Reading Challenge comes in! Below is a list of ten different prompts to help motivate you to read this summer. 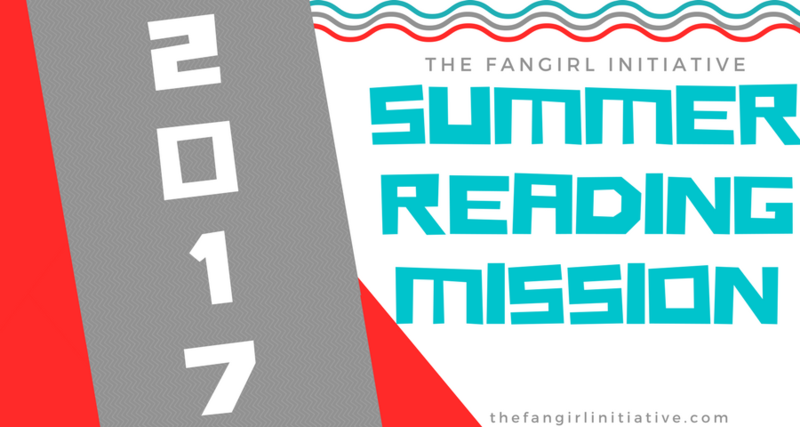 Read one book for each prompt and you can enter to win a special bookish prize at the end of the summer! 1. Read a book related to the beach or ocean. This can be a book with a beach on the cover or something that takes place on the ocean (pirates, anybody?) or any other crazy connection. Be creative! 2. Read something that takes place in a different place than where you live. Summer is all about taking vacations and going new places. Even if you don't physically go someplace new, reading opens up the opportunity to travel all over the world--and even into other worlds! 3. Finish a book series you've already started. We all have a book series we've started and failed to finish. Try to finish a book series you've started and cross that off your list for good! 4. Read a graphic novel (or comic book). Sometimes reading is better with pictures, just ask the pre-school kids who go to the library for story time. But here's a secret: adults can read books with pictures too! They're called graphic novels. Try it out. 5. Read a book you wouldn't normally read (whether because of genre or format). Sometimes it's cool to step out of our comfort zone and try something new. Read a new genre. Check out an ebook instead of a print book. Read a book that flips the opposite way. Try something new! 6. Read a book that inspired a movie or TV show. There are a plethora of book-based movies and TV shows. Before you race off to the theater or your nearest couch, read the book version and then compare. Which is better? 8. Read a book you own but haven't read yet. I don't know about you, but I have piles of books I own but have never touched. It's a problem, but here's my solution: pick one up and read it. Yes, just do it! 9. Read a book you picked for the cover. We've all been told not to judge a book by its cover, but honestly? I do that all the time. So partake in this forbidden book sin, and judge a book by its cover. Find the prettiest cover and read what's inside. 10. Read a book recommended to you. The majority of books I want to read come as recommendations from family, friends, and the random authors I follow on twitter. Take their recommendations to heart and read one. After all, if they recommended it, reading it might just reveal a part of their heart and soul to you. Here's a handy graphic you can share with your friends and encourage them to read along! We're hosting a bookish giveaway for the challenge! Could it be a shiny new hardcover? An oldie but a goodie? Maybe a stockpile of bookmarks for the next 50 years? You'll have to enter to find out! In addition, everybody is rewarded with reading books. 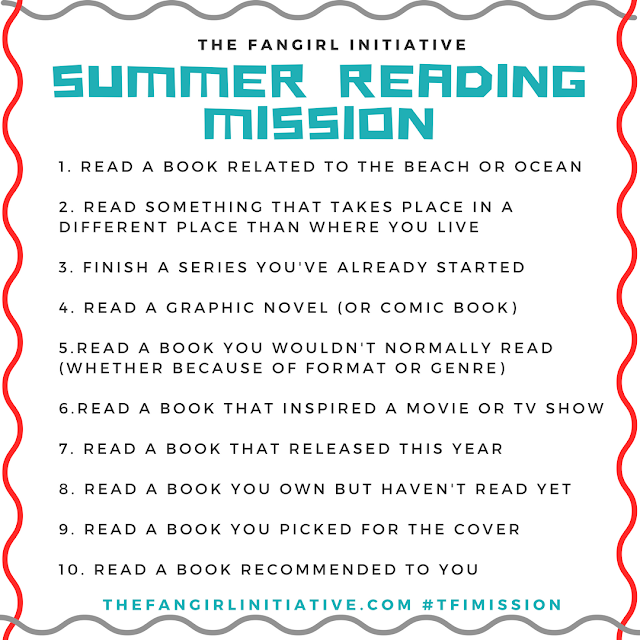 Just think: if you fulfill every prompt, you'll have read ten whole books over the course of the summer. That's epic! 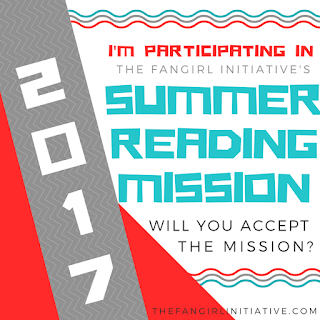 Between June 13 and September 1, try to read as many books to fulfill the prompts listed below. You can only count one book per prompt even if the book could fit under multiple prompts (no double-dipping). The point of the challenge is to read a lot of books, not complete specific prompts. You can complete the challenge in any order. You can try to complete as many challenges as you wish. For each prompt you complete, you can get an entry into the giveaway. The more prompts you complete, the more entries you receive, the higher your chances of winning. Comment on this post with at least one book you plan to read to receive an extra entry into the giveaway. Unfortunately due to shipping costs, only U.S. mailing addresses are eligible to win the prize. If you don't live in the U.S., you can still participate by trying to read as many books as you can! In addition, we'll be hosting discussions on our Goodreads group and on Instagram, so come join us throughout the summer! Now go, read those books. We also have a badge! Show off your TFI pride for an extra chance to win! Will you participate? What books are you planning to read this summer? The Fangirl Initiative is a collection of contributors dedicated to talking about the things we love. From TV recaps to gif-filled lists, this is your daily dose of stories and fandom.